JNN 26 July 2014 Algiers : Wreckage and remains from Air Algerie flight AH5017 has been found in northern Mali several hours after the plane carrying116 people crashed in that region, a Burkina Faso official told the Associated Press. Malian President Ibrahim Boubacar Keita reported similar findings to Reuters, saying wreckage of the flight had been spotted toward the Algerian border between the towns of Aguelhoc and Kidal. Meanwhile French President Francois Hollande disputed reports that the plane had been found at all, according to NBC. “No trace of plane has been found yet. All efforts will be used to find this plane. I have mobilized all our military in this area,” Hollande told reporters. 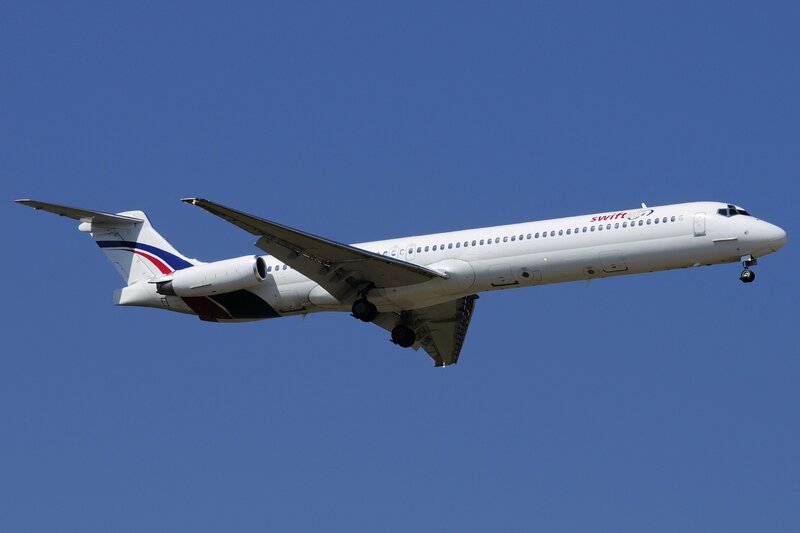 Swiftair, the Spanish airline operated by Air Algerie, said it lost contact with MD83 aircraft — with 110 passengers and six crew members — about 50 minutes after takeoff from Ougadougou, the capital of the west African nation. 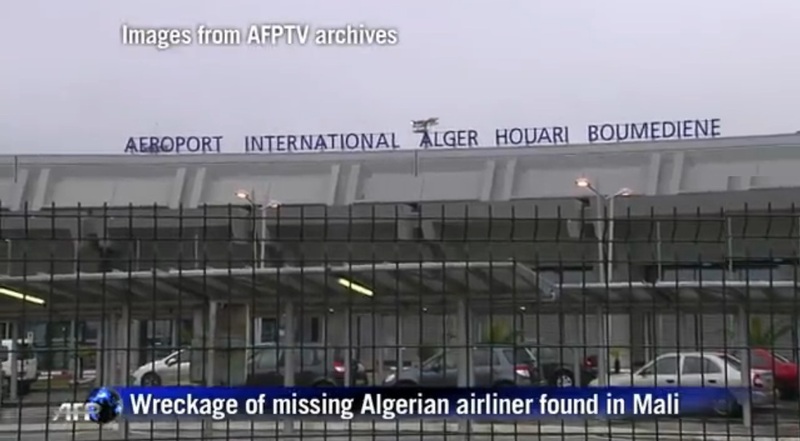 The four-hour flight was scheduled to arrive in Algiers at 5:40 a.m. local time. Gen. Gilbert Diendiere, head of an emergency response unit in Ouagadougou,told AFP that a witness saw the plane “falling” in the Gossi region of northern Mali. “We are in contact with the witness and we intend to survey the site,” Diendiere said. Burkino Faso Transport Minister Jean Bertin Ouedrago told Reuters the aircraft was asked to change its route because of a storm in the area. There were powerful thunderstorms in the region around the time the plane went missing. Speaking on French television, French President Francois Hollande confirmed the plane was diverted due to poor weather conditions. “The search will take as long as needed,” Hollande said. “Everything must be done to find this plane.” A pair of French warplanes had been scouring the northern Malian desert for the plane, Reuters said. An airline source told AFP that contact with the aircraft was lost while it was over northern Mali, considered a “high risk” flight zone for U.S. airlines. But a senior French official told Associated Press that it is unlikely shoulder-fired weapons used by fighters in the region could shoot down an aircraft at cruising altitude. The Associated Press reported the flight was carrying 51 French nationals, 27 Burkina Faso nationals, eight Lebanese, six Algerians, five Canadians, two Luxemburg nationals, one Swiss, one Belgian, one Egyptian, one Ukrainian, one Nigerian, one Cameroonian and one Malian. The six crew members are Spanish, according to the Spanish pilots’ union. ABC News reported that the airport’s Facebook page identified one of the passengers as Mariela Castro, niece of Fidel Castro and a prominent gay rights advocate. But the Telegraph later said the report was false. Flight AH5017’s aircraft — owned by Swiftair but operated by Air Algerie — was 18 years old. According to aviation-safety.net, the plane suffered loss of power in the left engine during a June 2004 flight. Six months later, blade failure caused the aircraft to experience left engine failure while climbing at 15,000 feet. Neither incident resulted in an accident. Patrick Gandil, head of the French civil aviation authority, told the Telegraph that the plane was was checked in Marseille “two or three days ago” and found to be “in good condition.” It had logged than 37,800 hours of flight time and made more than 32,100 takeoffs and landings, the Telegraph said. Air Algerie posted a phone number for families of passengers to call for information on the missing plane: +34 900 264 270. The crash is the third commercial air disaster in two weeks, and second in as many days. On Wednesday, a TransAsia Airways plane crashed in Taiwan while attempting an emergency landing in stormy weather, killing 48. On July 17, a Malaysia Airlines plane was downed over Ukraine, killing 298. Even before Thursday’s crash, commercial passenger aviation was in the midst of its deadliest year since 2010. If there are no survivors from the Air Algerie accident, then some 719 people will have been killed or are presumed dead in five major commercial passenger crashes so far this year. An average of 517 air-travel passengers were killed over the prior five years, according to statistics from the International Air Transport Association, an industry group. This year’s spike comes after a record low 210 deaths in 2013. William J. McGee, former FAA dispatcher and airline industry expert, told Yahoo News that he can’t recall a week of crashes like this one. “The pace of the last seven days is off the charts, no doubt,” McGee said. “If you step back and look at the three events, we’re still learning. You have one that was shot down, one that never should have been flying in weather. And now, you’ve got one that is just plain lost over one of the most remote areas technologically in the world. I don’t see any threads quite frankly other than they happened within days of each other. This entry was posted in AFRICA and tagged Air Algerie, Burkina Faso, French President Francois Hollande. Bookmark the permalink.